It may come as a surprise to some, but not all rock layers were laid down during Noah’s Flood. 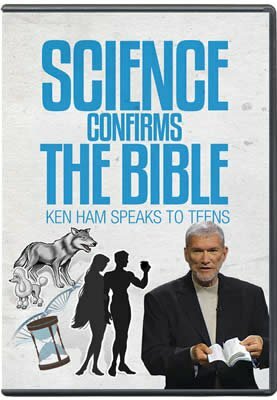 In fact, the evidence indicates that more geologic layers may have been formed during Day Three of Creation Week than during the Flood. What Do the Scriptures Tell Us? The opening verses of Genesis 1 tell us that at the beginning, on the first day, God created the earth with water on its surface. We are not told what was under the surface water. Perhaps God had created the earth’s internal structure of core, mantle, and crust, which were located under the water. What we do know is that on the second day God placed some of the waters of the earth above “the firmament.” Then on the third day God commanded the earth’s surface waters to be gathered into seas and the dry land to appear. This statement in Genesis 1:9 is simple yet geologically profound. Although the verse indicates that the water moved, it does not indicate exactly how the land came to be above sea level. One possibility is that God used catastrophic earth movements to almost instantaneously raise and lower blocks of the earth’s Day One crust to form dry land and sea basins. If that were so, as the crustal blocks were raised, the surface waters that had been covering them would have drained rapidly off the land. Rapidly moving water catastrophically erodes, so massive erosion must have occurred.1 Thus laden with sediments, these waters would have drained into the ocean basins, where the sediments would have been deposited rapidly. Because neither plant nor animal life had yet been created, the resultant sedimentary rocks would be devoid of animal or plant fossils. What Do We See in the Geologic Record? 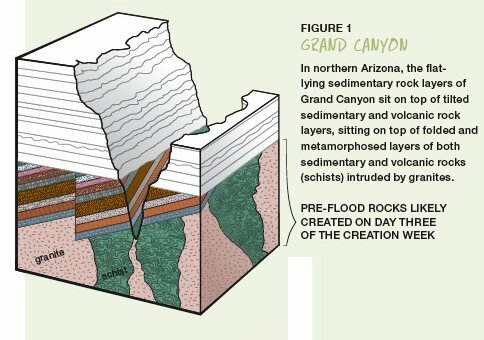 When most people visit Grand Canyon in northern Arizona, their eyes are riveted on the spectacular walls, which display about 4,000 feet (1.2 km) of flat-lying sedimentary rock layers (limestones, sandstones, and shales) (Figure 1).2 Filled with the buried remains of plants and animals, these layers must have been deposited during the Flood, which God sent to destroy every living substance on the face of the earth ( Genesis 7:23 ). In northern Arizona, the flat-lying sedimentary rock layers of Grand Canyon sit on top of tilted sedimentary and volcanic rock layers, sitting on top of folded and metamorphosed layers of both sedimentary and volcanic rocks (schists) intruded by granites. Underneath these layers—near the bottom of the canyon—are many other layers that do not contain plant or animal fossils. Violent processes, including volcanoes and rapidly moving mud and sand, must have created these layers. Many tilted sedimentary and volcanic rock layers (about 13,000 feet [4 km] thick) sit on top of other folded and metamorphosed layers of both sedimentary and volcanic rocks (estimated to have been originally about 40,000 feet [12 km], thick).3 After these metamorphic rocks formed, hot granites from deeper in the earth must have intruded into them (Figure 1). If we assume such deposition occurred at the snail’s pace we observe today, then these thick sedimentary layers would appear to have taken countless millions of years to be deposited. So if God, in fact, deposited all these sedimentary rocks during Day Three of the Creation Week as Genesis 1 implies, then is He deceiving us? When Jesus Christ the Creator ( John 1:1–3; Colossians 1:15–17 ) turned water into wine ( John 2:1–11 ) and broke five loaves and two fish to feed about 5,000 men, plus women and children ( Matthew 14:15–21 ), He performed miracles of creation. For example, the huge quantities of extra bread He created looked and tasted the same as bread that had been baked from dough prepared from flour obtained by crushing barley grown over a period of many months. However, Jesus did not deceive anyone by instantly creating this bread, because the disciples saw Him do it! So, did God deceive us by creating 30 miles (48 km) thickness of dirt in a day? Absolutely not! He was there when He did it, and He has told us about it in His Word. Similarly, witnesses saw how Jesus created. So Why Would God Lay Down Thirty Miles of Sediment in a Day? There is at least one good reason we know of. These rock layers contain enormous resources of metals that man has used to carry out the God-given dominion mandate. 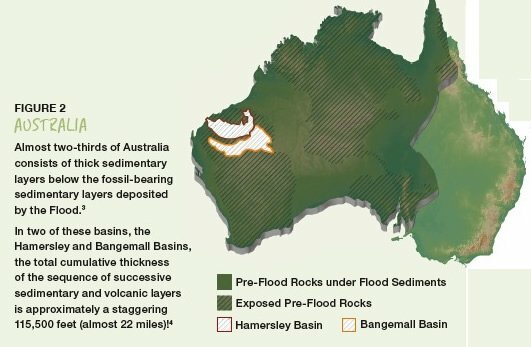 In Australia’s Hamersley Basin, and similar sedimentary basins elsewhere, are special layers called banded iron formations that contain countless billions of tons of iron ore from which we make steel, one of the basic components of our world’s infrastructure. Much of the world’s gold comes from sediment layers in South Africa’s Witwatersrand Basin. And we also find copper deposits, which even our pre-Flood ancestors must have utilized to craft utensils and tools ( Genesis 4:22 ). In one day, our infinitely wise, all-powerful Creator laid down some dirt layers 30 miles thick that are now deep in the geologic record and foundational to the landmasses we live on. These provide us with an abundance of resources, which we use to worship and serve Him for His purposes and glory. 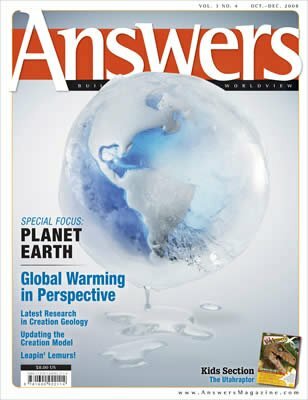 In this issue get the latest information on the current creation models and down-to-earth information about global warming. Also, you won’t want to miss the Kids Answers section about dinosaurs. 1 S. A. Austin, ed., Grand Canyon: Monument to Catastrophe (Santee, California: Institute for Creation Research, 1994), pp. 104–107. S. S. Beus and M. Morales, eds., Grand Canyon Geology, 2nd ed. (New York: Oxford University Press, 2003). K. A. Plumb, “Subdivision and Correlation of Late Precambrian Sequences in Australia,” Precambrian Research 29 (1985):303–329. A. D. T. Goode, “Proterozoic Geology of Western Australia,” in Precambrian of the Southern Hemisphere, ed. D. R. Hunter (Amsterdam: Elsevier, 1981), pp. 105–203; A. F. Trendall, “The Hamersley Basin,” in Iron-Formation: Facts and Problems, eds. A. F. Trendall and R. C. Morris (Amsterdam: Elsevier, 1983), pp. 69–129.